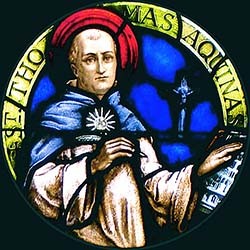 OK, that title was just an attention grabber, because Aquinas didn’t propose a Sixth Way, and the point I want to make in the next two two posts is covered in Aquinas’s Fifth Way, but it’s seldom appreciated. And that is that chance itself is part of the metaphysical argument for God. I think that’s worthy of discussion. I briefly mentioned Thomas Aquinas’s five ways of demonstrating God through reason in this recent post. The Fifth Way is “the teleological argument” for God, and though I believe our Eddie Robinson is right (contra some modern Thomists) to believe that design arguments are encompassed in Aquinas’s thought here, there’s no doubt that the more fundamental understanding is not about God making complicated things purposefully in the world, but about the directedness of even simple processes. Thomas argues that this shows they act designedly, not fortuitously, and that therefore some intelligent being exists by whom all natural things are directed to their ends; “and this being we call God”. The observation is of consistency and appropriateness in natural occurrences. This become a little clearer when one remembers that Aquinas was working with Aristotelian physics, in which it is the natures of things which, say, determine that those with massive bodies are attracted in a mathematically describable manner, or that those which are acids always combine with bases to form salts and water. But the argument is no less true on the modern physical scheme of natural laws, which is only to be expected as the early modern scientists who formulated the idea of “laws” envisaged the world as consisting of passive particles (Aquinas’s “natural bodies lacking intelligence”) which obey God’s natural laws, the direct equivalent of the Mosaic laws he gave for man to obey. Physical laws are, conceptually, entirely teleological: they determine that cause A will always have result B, ie that A is directed towards B. This simple fact of teleology has been largely sidelined, philosophically, in the current practice of science, being taken more or less as a brute fact, that couldn’t really be any other way. To say, correctly, that laws are merely empirical observations of what (up till now) has always occurred misses Aquinas’s point; that it’s actually very remarkable that anything should “always occur”. The issue of cosmic fine tuning – that the universe’s cosmological constants appear to lie within extraordinarily limits compatible with our existence – is an intriguing pointer towards an intelligent Creator. But the stronger evidence for design is simply that they are constants at all. I should point out that Aquinas’s argument, applied in this way to modern science’s law-based scheme, in no way means that the universe must be rigidly deterministic if made by such a God as he envisages. It is not a Deist’s charter. God’s intelligence and design are to do with order and intelligibility, not rigidity, and hence Aquinas’s reference to things “nearly always” acting in the same way. God might, in principle, do occasional miracles, or bend, break or circumvent the laws. Or, as some suggest, what science assumes to be constants might actually vary over time, without compromising the truth of the Fifth Way. Good parents will provide a stable environment and rules for children, but still let them stay up late or pig out on ice-cream on occasions. Neither, of course, do the empirical findings of science have any bearing whatsoever on the validity of the argument. If nature has consistent rules of cause and effect, then the ultimate origin of such rules is the matter to be explained, and not any precise mechanisms in the causal chain. Aristotle, from whom Aquinas’s approach clearly derives, was actively opposed to the Greek atomists, who believed that order arose spontaneously from the chance collisions of atoms. He argued that there is absolutely no reason to suppose that order will arise from disorder, and that is still a strong – possibly incontrovertible – supposition now. Even Lawrence Krauss, proposing that the universe spontaneously came into existence from the quantum vacuum, presupposes the pre-existence of fundamental laws – the very thing to be explained according to the Fifth Way. Likewise, speculations about a multiverse in which each universe operates with a different set of laws and constants has to explain how any process that selects the constants “by chance” for each universe makes them constant laws: in other words, there must be a teleological process in order to make laws, even those incompatible with life. I can envisage someone, in desperation, suggesting that universes generally are chaotic and lawless, but that by some remote contingency this particular one happened to turn out lawlike, which is why we’re here to wonder about it. But that misuse of the anthropic principle is simply to repeat the atomists’ empty claim that chaos generates order spontaneously. I’ll leave it to the next post to deal more with “chance”, but here I just want to point out that “chance” and “chaos” (in the primal sense rather than the technical sense of “chaos theory”) are not at all the same thing. It’s quite hard to see that, or to give an analogy, because in fact we live in a cosmos that is unquestionably lawlike at the level of experience. Everything we experience as “disorder” is, at most, the disruption of existing order – a disruption usually caused by other levels of order. Chaos never produces order in our world. In fact, entropy demands the exact opposite, that existing order always decreases. Neither could it occur in any possible world, for a simple reason – we would have to ask how that world would be ordered differently from ours if chaos were to be able to produce its order. And that does not compute. Perhaps one mental exercise to illustrate this in a limited way would be to imagine what the world would be like if one simple phrase in the Genesis creation story were not true; that the creatures God made did not reproduce “after their kinds” but fortuitously. That alone would pretty soon begin to reduce the world to primordial chaos. I’d like to close this post, though, with another example of a more whimsical, but on reflection quite instructive, kind. Animals are divided into: (a) belonging to the Emperor, (b) embalmed, (c) tame, (d) sucking pigs, (e) sirens (f) fabulous, (g) stray dogs, (h) included in the present classification (i) frenzied, (j) innumerable, (k) drawn with a very fine camelhair brush, (l) et cetera, (m) having just broken the water pitcher, (n) that from a long way off look like flies. The humour, Foucault supposes, comes from the obsessional attempt (a-n) to impose order on what is entirely devoid of order. The connection to a godless universe is the metaphysical inevitability (according to Aquinas) that it might be the best order one could impose on the reality. Next time – chance and teleology. That is the take of Feser, etc. I think it’s a gross misuse of the word “teleological” (and of the word “directed”). Motion in a straight line, as Newton understood it, is entirely *non-teleological*, because the object so moving is *not* animated by any end (*telos*); it is not trying to stay in a straight line, or headed anywhere in particular; it merely experiences no net force, and therefore does not change from the direction in which it is already headed. This is quite different from Aristotle’s conception of natural motion. Aristotle’s conception of natural motion has no room for such “indifference” of moving objects regarding where they are headed. Aside from all this historical/vocabulary explanation, it is easy enough to see the difference between a teleological notion of motion and a non-teleological one. The teleological idea suggests that each natural thing will move in accord with its own specific nature, i.e., fire will go up, air up, water down, earth down, etc. The non-teleological idea suggests that each natural thing will move in accord with some universal property (“mass”) that has nothing to do with the object’s specific nature. So, for example, if I push a wheelbarrow it will move differently than if I push a standing domino, because those things have different natures; one will tend to fall, the other roll. But if I drop the wheelbarrow and the domino off the Empire State Building, their specific natures are irrelevant, and they will fall in accord with general laws of mass, gravity etc. Aristotle had no theoretical way of accounting for this (though doubtless he understood the practical reality as well as we do), but Newton did. The fall of falling objects is non-teleological, i.e., is governed by general principles that have *zero* to do with the *nature* of the object (as Aristotle/Aquinas understood “nature”), and everything to do with its properties *qua* material. Even if you say the “end” of the raindrop’s motion is (in accord with Newton’s physics) to find the center of gravity of the body with which it collides (the earth), that is still not “directed” motion to the earth, *qua* earth, but only to the earth *qua* attracting mass; after all, if a sufficiently massive body were introduced, the raindrop would fall toward that body rather than the earth. In Newton’s universe, there is no natural “down” for objects to fall toward; in Aristotle’s, there is. So “natural” in Newtonian physics does not mean “directed” as the term is normally used in English. “Compelled to go in the direction of the greater mass” is not exactly “directed”, which has overtones of intelligent design or planning. And in any case, where a body is influenced by two different masses, it then takes a path which is no longer directed toward the center of either of those masses, but shoots off away from both of them, now aiming at neither object in particular, striving for no new third center of mass. Its new path is a compromise between two conflicting “ends” of motion. It may never return to the general vicinity of the bodies which first gave it its speed and direction. This is not what is normally meant by directedness to an end, even if the new trajectory can be calculated with great accuracy. The new trajectory is an *accident* of the relative masses of the bodies the moving body happened to pass near; the new trajectory is in itself not aimed at anything. If Feser wants to say there is a sort of “direction” to motions even in Newtonian physics, that is fine, but it blurs things, and creates misunderstanding, not to make clear how very different that “directedness” is from the directedness spoken of by Aristotle. But even if we allow “directedness”, we don’t need the word “teleological” in the Newtonian context. It obscures the huge difference between Newtonian and Aristotelian physics, cosmology, etc. I personally think that the concepts of individual natures, laws and Thomistic teleology are closer together than you credit. The idea of “natural laws” I’ve long felt problematic, in that whereas one can say coherently that God spoke his torah through prophets, that it is written on tablets of stone in the ark or in the Bible, that it is learned by the community, that it dwells in the individual heart by meditation, etc, physical laws are just somehow “out there”. But where? And is the idea of passive particles obeying external mathematical laws in an immaterial realm anything more than a convenient way of working? Then again, anything you say about “mass” being a universal separable from an individual species’ nature could be said about “tendency of heavy things to seek the centre of the universe”, or the universal tendency of seeds, and not just acorns, to grow. Aspects of individual natures are shared, and so become universals, and so can be conceptualised as laws. One could, I suggest, comfortably replace the concept of “laws” with “natures” in science, if the complete reformulation of physics, and the increased difficulty of thinking abstractly of the properties, was worth that investment. To speak “teleologically” one just has to choose the terms of ones “laws” and “natures” wisely: the law “thou shalt not kill” is intended to preserve life, and incurring the attached penalty is, in legal terms, incidental – in Thomistic terms it would be the result of perverting ones nature, which was created in accordance with the law. Similarly the natural “teleology” of a fat man to seek the centre of the earth does not make it part of his nature to be impaled on railings if a balcony collapses, any more than the law of gravity does. The fact that formal causation is inherent in Aquinas’ approach is, to my mind, so much the worse for modern science. It has lost explanatory power through abandoning formal and final causation. It did that in order to make reality more tractable, abstractable and so quantifiable, which is absolutely fine as long as it recognises its retreat from important aspects of reality and therefore its limitations. But all that aside, let us suppose that Feser and the other modern Thomist’s application of Aquinas is wrong. I would still argue that the consistent directedness and specificity of natural events, aka laws, is a phenomenon pointing to an intelligent being, which we call God. Omit the word “teleology”, and call it “Feser’s Fifth Way” if you like, but the logic still applies. This gets complicated, because I wasn’t trying so much to respond to your OP as to one statement in the OP, and that statement I objected to mainly because of the context it is given in the writing of Feser. I see the motivation of Feser, Beckwith, etc., as to rescue Thomas from the charge of obsoleteness by distinguishing between his “science” (which we can scrap) and his “metaphysics” (which remains true, and compatible with modern science). I maintain that neither in Aristotle nor Aquinas can science and metaphysics be entirely separated in this way, and that at least some of Aquinas’s metaphysics has to be wrong if his science is wrong, and further that some of Aquinas’s science is wrong in part because his metaphysics is wrong. But that is not an argument I’m prepared to make at the moment. For now, I merely note that I do not consider it important to believe or show that Thomistic metaphysics is compatible with modern science, because my interest in Thomas is not apologetic and I don’t care if Thomas turns out to have been wrong about something, even something important. My critique of modernity, unlike Feser’s, does not rest on Aquinas and does not need to. I agree with Feser that modern science, properly understood, isn’t completely against all Thomistic or Aristotelian insights. But he seems to me to swing too far the other way; in his urge to combat blind adulation of the modern (and I’m just as much against blind adulation of the modern as he is), he seems to rewrite Aquinas and Greek thought to make them correspond with his idea of sound metaphysics; but this reflects the typically ahistorical approach of the philosophy professor. The philosopher per se is more concerned with the internal coherence of ideas and their truth, not where they came from or what they meant as originally formulated. But my philosophical training is historical — studying the great ancient and medieval texts, often in the original languages, in the original contexts, and trying to understand the thought of an era as it understood itself, not as it would have to be were it to correspond with “classic theism” or any other philosophical systematization. So my remarks on Greek and 17th-century thought come from that historical discipline, and in that historical light I analyze conceptions such as teleology differently from Feser. You are following Feser, I think, in trying to find the common elements between Greek thinking about nature and early modern scientific ideas of nature. I don’t belittle such a quest for common elements. I do think there is historical and thematic continuity between Greek and 17th-century thinking. I don’t say that ancient Greek ideas of nature had *nothing* in common with modern ideas of nature; otherwise it is hard to imagine how scientific ideas about nature developed. But I do think it is necessary not to paper over important differences in the quest for common elements. As for your final argument that laws point to an intelligent being, I have never contested that. But one doesn’t need to adopt Feser’s terminology or Feser’s Thomistic apologetics to believe that. One doesn’t even need Aquinas. I could have figured it out had Aquinas never lived. Indeed, Aquinas’ Fifth Way argument is not particularly well-written or clear. Feser complains that moderns have confused it with Paleyan arguments, but that is partly Aquinas’s fault because some of his phrasing is murky. Of course, if Aquinas were in a modern university he would have presented the Five Ways as a conference paper, the writing would have been criticized, and he would have gone back and re-written it, eventually publishing it in clearer form in a book or article. But as I say, even if Aquinas had died of a plague before writing the Summa, one could make the argument that the existence of laws in nature indicates an intelligent, planning mind. And of course I agree with you that this is compatible with the Biblical idea of God. Indeed, I think there is little doubt that the Biblical idea of God is the main source of the idea of “laws of nature” — an idea not found in Greek literature, at least not with any clarity, except perhaps in late Stoicism (which was not the matrix of Thomas’s Greek thought). But again, accepting Thomas’s odd mix of Aristotle and Bible is not necessary in order to see this. There is plenty of good writing on the religious origin of the role of “laws of nature” in modern natural science by Francis Oakley, Maggie Osler, etc. I don’t mean that the idea of laws of nature is fully developed in the Bible — it isn’t. But the Biblical conception of God as cosmic monarch became an ingrained part of the Western Christian psyche and world view, in a way that it was never part of Aristotle’s or even Plato’s world view. Greek science is of course one of the sources of modern science, and “regularity” in nature is a common element between Greek and modern, as you rightly say. But the Biblical side is important, too. You can believe in regular laws if you believe in a Lawgiver. And while the Greeks believed in regularity in nature in the sense of “things have tendencies,” the modern idea of regularity in nature is more thoroughgoing. It is not just that, as the Greeks recognized, the world contains a whole bunch of entities, each of which has certain tendencies; it is that there is a whole set of underlying universal tendencies, in comparison with which “type” tendencies are of little explanatory importance. This difference has sometimes been explained in terms of the difference in meaning between “cosmos” and “universe”; “cosmos” originally contained a greater sense of heterogeneity — a coordination of heterogeneous parts in a larger order; “universe” in its modern meaning suggests a fundamental homogeneity — a sameness throughout. In a universe, there is only one principle of order (e.g., a law such as gravity), not two (i.e., the tendencies of individual natures, plus coordination by something transcending those natures). The idea of a divine will producing natural laws throughout the length and breadth of the world fits in very well with our modern notion of “universe” — one word, one turning, one thought governing all. And of course the universe is “directed” by the divine mind. We are not disagreeing about that. But the seventeenth-century thinkers saw *the specific kind of direction* employed by God with more clarity than Aquinas, because their minds were not muddled by a half-pagan, half-Christian cosmology and physics. I do not see Feser’s writing — at least what I’ve read on his blogs — as doing justice to this; I think his partisanship for Aquinas’ metaphysics impairs his ability to write about the history of science with real clarity. Oakley, Collingwood, Osler, Hooykaas, Cassirer, Koyre, Burtt, etc. are better guides. As Feser himself points out, the statement of the five ways in Summa 1.2.3 is simply a summary of ideas built up and argued throughout the Summa and, indeed, his whole corpus. He’s right there, even if studying the texts one disagrees with his interpretations. “The natural necessity inherent in things that are determined to one effect is impressed on them by the Divine power which directs them to their end, just as the necessity which directs the arrow to the target is impressed on it by the archer, and does not come from the arrow itself. There is this difference, however, that what creatures receive from God is their nature, whereas the direction imparted by man to natural things beyond what is natural to them is a kind of violence. Hence, as the forced necessity of the arrow shows the direction intended by the archer, so the natural determinism of creatures is a sign of the government of Divine Providence”. As the Catholic Encyclopedia says (citing some sources from Bacon to Voltaire), to Aquinas intrinsic teleology in nature was primary, and the extrinsic teleology of human volition – ie conscious purpose – was secondary and derived. That’s what makes for the key idea that final and efficient causation are not mutually exclusive, but inextricably linked within nature. In theological terms, that means that God doesn’t think of an end and then beaver away to find some means to it – he wants a tree, so he’d better make an acorn (which is certainly the attitude often seen on UD comments, with much talk about design constraints and so on). Rather, he creates efficient and final causes together – the difference mainly being the explanation you’re trying to make at the time. Now although you see the reality of natural law being teleological in that intrinsic sense, it’s not the way law is usually perceived nowadays, finality being excluded except at the unconscious level (almost certainly out of the desire to exclude extrinsic finality as in Lou’s example of “man as the goal of creation” below – which you’ll recognise as an extremely non-Thomistic use of teleology). Hence I felt the need to approach finality first via the guy to whom it is natural, before applying it to the current way of looking at things, to which it is not, especially as I’ve used Aquinas to describe the four types of causation for the last year or two. As you probably know, this is not something excluded a priori. Science has advanced since Aristotle. All known laws of physics can be formulated without taking into account extrinsic finality. The only people who insist on keeping the idea alive today do so for ideological reasons. Eddie, I agree that it is hardly useful to broaden the notion of teleology to include absolutely everything. If laws of physics can be expressed as differential equations with respect to time, so that the speed and direction of an object’s motion in the next microsecond is entirely determined by its state of motion (and the forces acting on it) a microsecond earlier, it seems wrong to say that it is heading somewhere in particular. Also, it turns out the laws of motion in Newtonian mechanics are all direct consequences of the symmetry of space; that there is no preferred direction (Noether’s theorem). The concept seems practically anti-teleological. Note though that many laws in physics can also be re-written as “least action” principles: a particle’s path is always the one that minimizes a quantity called the action. This might seem teleological until one realizes that it follows from the differential rules mentioned above. In biology especially, and probably in physics too, it is useful to distinguish explanations that use teleological language as shortcuts for the simpler, more universal, but more difficult-to-express explanation, from those which depend fundamentally on teleology and cannot be reduced to simple differential explanations. An example of the latter would be the claim that man (or something very like us) arose because man was the goal of creation. I agree with part of your analysis regarding the laws of physics and teleology. One of the problems is that Biblical and Greek conceptions of telos and purpose get muddled. Aristotle offered no argument that “man was the goal of creation”; that is not what Aristotelian teleology was about. For Aristotle there was the telos of an acorn, but there was no telos of the universe as a whole. That idea — that the world as a whole has a purpose or end — is brought into Western thought by the advent of Christianity (and Judaism before it). I’m not of course attacking Christianity for speaking about the purpose of the world as a whole. But my arguments for the intelligent design of particular parts of nature, and my assent to an overall vision of the world taught by Christianity, I keep separate. I don’t neither either of those things in order to sustain the other. 1 Philosophy: the explanation of phenomena by the purpose they serve rather than by postulated causes. 2 Theology: the doctrine of design and purpose in the material world. It is obvious that the dictionary does not include a scientific definition for teleology. In science, we can easily identify a mechanistic causal chain and in some cases we are certain of the ‘direction’ of the event. Take for example the reaction H2 + O2 → H2O; there is no question of a direction and end result in this case – in fact chemical thermodynamics, which is as fundamental as constants, is based on a clear direction, in that any chemical species, if allowed to undergo their ‘natural’ chemistry, will inevitably undergo reactions that yield stable chemical compounds. Chemical kinetics takes us to areas where complications can occur and we may not be always certain of the end result, but a chemist can ultimately arrive at the ‘end’ (or purpose if you wish) if he understood all conditions and species involved. This certainty that scientists feel regarding various phenomena is often equated with ‘laws of science’. Yet certainty (and uncertainty) is related to human outlooks, while ‘laws of Nature’ is a phrase that seeks something from Nature. Jon, your discussion(s) on objectivity should kick in at this point – if Nature reveals herself, shows us what to do as science, I would accept the odd notion that we can arrive at something that Nature imposes. If, as good sense and reason would show, scientists are ‘probing’ and ‘investigating’ the objects we find in the Universe, than Nature does not pronounce laws. For those of us who believe God is the Creator, the use of ‘teleology’ is self evident. My reading of Thomas is that he continued in the tradition of the Patristic writers, by showing that pagan philosophy can be shown to conform to the teachings of the Faith – Primal cause, efficient causation and so on, were dealt with by Aquinas, who demonstrated that Aristotle’s thinking can be accommodated within Christian thinking (e.g. the prime mover is God). Aquinas however, did not indicate that Aristotle’s outlook was that of a Christian. Science nowadays, is seen by some philosophers and scientists in bewildering ways – from one extreme we have materialists claiming the only thing worth knowing is from science, and all else is nonsense, and the other extreme seems to be that science must be subjected to all sorts of metaphysical constraints, theological purposes, definitions of what it is to be a human being, or what have you. I take the view that science is a way that we human beings can obtain knowledge by studying the physical world around us, and we should apply this to benefit humanity and the earth we live in. That provides more purpose and direction than all philosophical arguments put together. You point out another aspect not covered by my exchange with Eddie – that natural laws are not found, but humanly constructed to explain, with more or less accuracy, consistencies in nature. More than that, they’re constructed to explain consistencies in an abstracted idealization of nature (witness the complications of chemical kinetics to which you allude, which presumably need to be taken into account to understand what “ought” to happen in some simpler universe that doesn’t actually exist). So somewhere behind Newton and Aquinas both is a core truth that “there are consistencies in nature”, and that is what I’m most interested in this post, in order to lay a foundation to explore how chance shares that consistency, which is the opposite of the chaos of an “undirected” (in my terms ateleological) nature. Your dictionary consultation points out the danger of using a daily-purpose dictionary to learn the meaning of specialized philosophical terms. I’m not blaming you for the dictionary, of course. I’m merely pointing out that you are better off to consult special works on the subject-matter than to take off from a dictionary definition. Some of the best general works in this broad area, aside from Aristotle himself, are by Burtt, Lovejoy, Koyre, Collingwood, Oakley, and Hooykaas. Generally people who write about these matters at the scholarly level have read a good number of the above authors. Are you offering a thesis on teleology in the physical sciences? No — merely suggesting that you not rely on general dictionary definitions for philosophical and theological terms that have long, rich, and complex histories, and pointing to you to some of the scholarly literature which you may not be familiar with. If you need specific book titles I can make some suggestions. From your response, other sources you rely on do not provide a thesis on teleology in the physical sciences. Thus there is not need for a lengthy discussion. I never made any claim about “teleology in the physical sciences” — as you mean “physical sciences.” I was merely pointing out something that you evidently did not know, i.e., that the dictionary definition you consulted was *wrong* — that the author of that dictionary entry simply did not know what he was talking about. I thought you might like to know this, so that you would not base your speculations on an error in the dictionary. If you choose to ignore knowledge that I have gained from 40 years of studying the Classical Greek language, the Latin language, philosophy, the history of ideas, the history of science, etc. — that is of course entirely your right. I’m simply leading you to the water. I can’t force you to drink. You know, GD, if I read something in a reference book on geochemistry — or whatever your field is — and that thing that I read was incorrect, I would be *grateful* if you informed me, based on your intimate knowledge of the field, that my source was unreliable and that I should not base anything on what it said. I would regard you as a friend for warning me of a pitfall in a field I was not familiar with. I’m sorry you don’t feel the same way when someone does a parallel favor for you. I will try again (sigh!) – I tried to make a simple point using the Oxford. I agree with you what I used is scant and by no means sufficient for a detailed discussion – but it was sufficient for my purpose (end result) which was to point out a distinction between physical science, philosophy and theology when discussing Jon’s post. Perhaps you may read far to much in some of my comments – but this is not a snarky remark to you – just a simple observation. There’s a full treatment of the Fifth Way by Prof Christopher Martin here, particularly in relation to science. He deals particularly well with the repricocity between final and efficient causation, and how the former is actually presupposed in scientific accounts that seem only to be concerned with efficient causation. Oddly enough he too cites a passage from Borges. Jon, I just looked at Martin’s argument. I’ve just checked the Latin text, and I think he is right — and that Feser is right, too — about what Aquinas is arguing in the Fifth Way. However, his other remarks, against Paley and natural theology, I consider to be as stubborn and wrong-headed as Feser’s. Incidentally, while I like Martin’s analysis of what Aquinas is saying, I add that I disagree with Aquinas’s first premise, i.e., I think that Aquinas’s inference of end-directedness is unwarranted. But even if it’s not, Aquinas provides *nowhere near* enough argument in the Fifth Way to establish that he’s right. His argument is sketchy and suggestive, nothing like a hard rigorous proof. One of Martin’s objections is silly. He says that Paley could at most prove the existence of a watchmaker God or Masonic impostor, not the real Christian God. Right! As if the “God” proved by Aquinas’s Five Ways is the specifically Christian God, rather than some very broad general metaphysical God, a source of motion, etc. — the God of the philosophers, not the God of Abraham, Isaac and Jacob. The Five Ways don’t get you any closer to the God of the Red Sea or Golgotha than Paley does. So to fault Paley for something that the Five Ways are equally guilty of is ridiculous, and clearly motivated by theological partisanship. Nonetheless, though I don’t personally need a proof of God, if apologetics are wanted, there never has been an argument for God more successful with the masses than the Paley sort of argument. The arguments of Aquinas etc. have never been effective with more than .01% of the population, the kind of people who have the leisure to study metaphysics 24/7. For the average person, the Paley sort of argument is much easier to grasp, and it has the advantage of being partly testable by the senses. But of course the professional academic philosopher has always had a sort of upper-class snobbery toward arguments that are popular with the masses — I suspect very often merely *because* they are accessible to the masses; the philosopher likes to feel he is so much smarter, with his abstractions, than the average guy with his crude “empirical” reasoning. So it’s not surprising that the ivory-tower Thomists would denigrate Paley and anyone who likes his arguments. We have the same phenomenon in theoretical physics, whereby those who hold fiercely to things like string theory and multiverses feel that there is nothing wrong with asserting a truth about nature based entirely on equations and very abstruse theoretical considerations; they think that inner logical consistency and “mathematical elegance” are sufficient criteria for truth, and they tend to regard those physicists who demand more empirical evidence for strings or multiverses as lower-order thinkers who don’t really understand what physics is. I feel the same sort of scorn in Feser etc. ; I think his dislike of Paley is at least as much because Paley’s argument can be grasped, and defended in some detail, by any intelligent layman who understands the basic facts of nature and has basic logical reasoning powers, whereas Thomism can be grasped only by those who have spent years studying specialized technical monographs on the subject. But to me that is just left-over class snobbery from the days of Europe when only a few were educated and the ruling classes felt it important not to teach the masses, or even the middle class, the arts of reasoning. I’ve not read a line in any of Feser’s blogs where he actually gives any good arguments against Paley. I don’t mean I haven’t seen him yapping (ad nauseam) about why Paley in principle can’t get us to the right kind of God (I could repeat Feser’s argument on that point in my sleep, he’s such a broken record); I mean, I haven’t seen him refuting Paley’s actual arguments to design. I haven’t seen Feser provide one line of counterargument. Indeed, it is not clear to me that Feser has even read Paley, as opposed to reading about Paley. Certainly I have never seen him quote a passage of Paley and do an exegesis. Sorry for venting, Jon. I do consider these modern Thomists arrogant and dismissive, and massively one-sided, not dealing nearly enough with the Bible, too much oriented to the God of the philosophers, biased to Aristotle rather than Plato, irrational in their opposition to Paley, and generally haughty and aristocratic in their argumentative style, almost as bad as the materialists and atheists that they oppose. And in the end I think that Christian Aristotelianism is not the way to go, that Aristotle’s God and the Biblical God are 90% incompatible, and that Thomism, though containing great pearls and well worth studying and learning from, is not *overall* the philosophy that modern Christians should be turning to. This is not of course to say that your particular arguments borrowed from Thomas are wrong in any particular case. They may all be quite good. But I find your constant appeal to these Thomists a bit off-putting; they seem to have appointed themselves the defenders of true Christian theology and to regard Paleyans and all others as muddy thinkers who are leading Christians down the garden path. Well, I imagine that the Reformed, Orthodox and other scholars and philosophers may have some objections to this characterization of their theological thought as sub-rational and sub-philosophical. I wish Feser, Beckwith, Martin etc. could give their self-satisfied air of rational superiority a rest. We live in postmodern times, Ed, which positively means people are aware that the intellectual approaches of the past vary, but negatively that any disregard for the historical context of thought is likely to be deliberate rather than accidental, because the issues are well-known. Of course in the case of something like Neo-Aristotelianism, the allowances are being made for a regrettable lapse of a few centuries into degeneracy from which we’re now emerging (without noticing how we’ve tacked on some modern baggage on to our heroes). The sad thing is that there’s an element of truth, and necessity, in these things – great minds of the past may well have a lot to teach us, but will need to speak into our own culture and so be used selectively. Paley’s approach, as you say, still speaks to many people (including myself) in an age in which empirical observation is glorified (whilst of course in pre-modern times it was regarded as fallible compared to reason). Just as the Evidence-that-demands-a-verdict apologetics you dislike probably convinces more non-scientific people now than Paley or the scholastics. All of them fall short of proof, and will not convince the skeptic – except sometimes, when the Spirit is moving. But in these two posts I certainly had no such intention of proving a point to unbelievers, but perhaps more of removing a stumblingblock to believers. Chance, after all, is always put up as the antithesis to divine creation and design, and so it would be if it were properly defined, in that context, as pure chaos rather than the epistemologically opaque, but highly organised, contingency we see within the created order.